Linz 2009 European Capital of Culture - Publications and Print Products. Linz09 set great store by publishing its content in publications that offered a wealth of information and were designed with a great deal of attention to detail. The pillars in terms of communications were the Programme Books 1, 2 and 3, the Linz Book , the School Book and the History Book. These were supplemented by a volume of photos, Die Bilder , which once more conjured up Culture Capital Year in all its glory on 256 pages and with more than 1,000 photos. Die Bilder was designed to give visual expression to the emotions that Linz09 had evoked and to the memories of Culture Capital Year. The Linz Book was neither a city guide in the traditional mould nor a classic coffee table book, despite its many gorgeous photos. It contained a selection of stories and both critical takes on Linz and declarations of love, which added up to an candid and highly unusual portrait of the city. The authors Linz09 was able to enlist for this project included professional writers, journalists, pupils, migrants, scientists and museum directors. The School Book gave a detailed overview of the part of Linz09’s programme that was especially suited for pupils, teachers and schools in general. The History Book focused on significant aspects and themes of those Linz09 projects that dealt in one way or another with National Socialism, its antecedents and its consequences. It made an analytical contribution to an understanding of the city’s past and to the way Linz had tackled this part of its legacy. In the field of corporate communication the Neuner was another important print product in addition to leaflets, flyers and postcards for mass distribution, which were designed to boost Linz09’s image and to draw attention to programme highlights and to services. 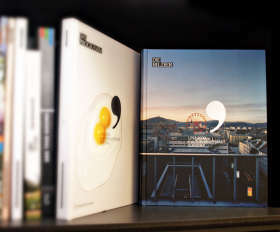 To promote the Culture Capital in the area of tourism, a leaflet was published in February 2008 in German, English and Italian, entitled “Linz, Willkommen” [Linz, Welcome], which covered both the sights of the city and the highlights of the programme in 2008 and 2009. In the meantime this leaflet has undergone further modification and has become part of the publicity material of the Linz Tourist Board. To underscore the hospitality aspect, Linz09 compiled a language guide in collaboration with the Economic Chamber of Upper Austria, which was designed to facilitate the communication with visitors from abroad. Entitled wir09, the booklet contained phrases in English, Czech, Slovene, Hungarian, Italian, Polish, French, Dutch and Spanish that are most frequently used in situations tourists are likely to find themselves in and facts and information tidbits about the respective countries to enable Linzers to get a conversation going. On the project level all great exhibitions were accompanied by comprehensive catalogues realised in cooperation with different publishers. Demand was particularly strong for “Kulturhauptstadt des Führers. Kunst und Nationalsozialismus in Linz und Oberösterreich”, the twin of the eponymous exhibition in the Schlossmuseum Linz. Catalogues were likewise published for LINZ TEXAS, the trilogy SCHAURAUSCH, TIEFENRAUSCH, HÖHENRAUSCH, POLITISCHE SKULPTUR [Political Sculpture], TOULOUSE-LAUTEC, ZAUBERKÜNSTE [Doing Magic], DAS GRÜNE BAND EUROPAS [The European Green Belt], SEE THIS SOUND, BEST OF AUSTRIA, DER “FALL” FORUM DESIGN [The “Case” of Forum Design] and FESTIVAL DER REGIONEN [Festival of the Regions]. As a rule the catalogues were edited either by the cooperation partner or the project author. By providing a wealth of visualised statistical data, the Linz Atlas came as close as possible to an objective depiction of the city, untainted by subjective prejudice and by self-serving political claims. “Linz. Randgeschichten”, with texts by the likes of Anna Mitgutsch, Erich Hackl and Eugenie Kain was another of Linz09’s book projects. HÖRSTADT [Acoustic City], IN SITU, DER KRANKE HASE [The Ill Rabbit], KUNST FLOW, DESIGN JUNGLE, TURMEREMIT [The Hermit of the Tower] and BIBLIOTHEK DER GERETTETEN ERINNERUNGEN [The Library of Rescued Memories] likewise called for substantive documentation. Almost each one of Linz09’s projects had its own print products, be it in the form of invitations or postcards, flyers and folders, (folding) posters or leaflets. Click here to find selected books, CDs and DVDs that were made either to spread the good news of Linz09 or to accompany and document individual projects.